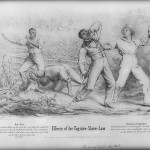 The Fugitive Slave Act of 1850 helped spark the Christiana Riot. 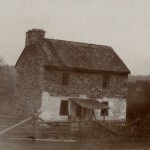 Prior to its passage, escaped slaves in Pennsylvania were essentially free, as Pennsylvania law forbade forcible removal of African Americans for the purpose of returning them to or selling them into slavery. Under the new federal law, it became mandatory for law enforcement officers to arrest suspected fugitive slaves, even in free territory, and made assisting an escaped slave a punishable offense. It was through this law that Edward Gorsuch received warrants to arrest the four men at Christiana. 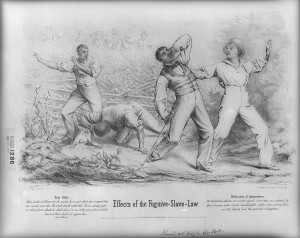 This 1850 lithograph from an abolitionist publication shows a group of African Americans being ambushed by armed slave catchers. The text below the illustration consists of passages from the Bible and the Declaration of Independence, both about the equality of men. Northern attitudes toward abolition changed after the Fugitive Slave Act passed. Free state residents resented being forced to participate in slavery. They could no longer ignore the issue and reacted by increasingly supporting abolition. On the night of September 11, 1851, Edward Gorsuch of Baltimore County, Maryland, rode into Christiana, Pennsylvania, with a gang of eight men intending to arrest four fugitive slaves. The fugitives were being sheltered in this homestead, which belonged to free African American William Parker. Parker had moved from Maryland into Pennsylvania, where he organized a self-defense group to protect the local black community from slave catchers. When Gorsuch arrived at Parker's home, a group of at least fifty men was already armed and assembled, prepared to protect the fugitives. After Gorsuch was killed in a chaotic clash, Parker fled farther north to Canada where he continued his abolition work. 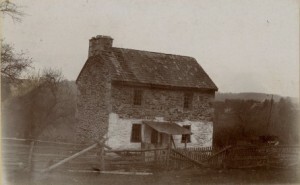 The homestead he defended stood until at least 1890. U.S. District Court Judge John Kintzing Kane was born in Albany, New York, and moved to Philadelphia in his youth. He began practicing law in the city in 1817 and was appointed a federal judge by President James Polk in 1846. In 1851 he presided over the Christiana Riot trial, in which Castner Hanway, a white resident of Christiana, Pennsylvania, was accused of being the mastermind behind the violent clash. After hearing witness statements, the jury determined that Hanway was not guilty. Kane presided over other trials related to the Fugitive Slave Act and in 1856 he sentenced a Quaker to jail for refusing to participate in the recapture of a slave and her children in Philadelphia. During the 1850s, Northern abolitionism developed, Southern defense of slavery hardened, and debates over the expansion of slavery gripped the nation. When pro-slavery and anti-slavery factions met at Christiana, Pennsylvania, a mere 20 miles north of the Mason-Dixon Line, the events that followed and the subsequent trial in Philadelphia became flashpoints that deepened the sectional divisions between the North and South. On September 11, 1851, slaveholder Edward Gorsuch (1795-1851) and his party of eight men rode into Christiana from Baltimore County, Maryland, with warrants for the arrests of four fugitive slaves. Upon reaching the home of William Parker (1822-? ), a fugitive slave, Gorsuch and his party were met with armed resistance. A large group of armed black men and women surrounded Gorsuch’s party and demanded that they leave Pennsylvania immediately. When Gorsuch refused to vacate Parker’s property, chaos ensued. Indeed, Gorsuch’s men fired guns as black men and women attacked Gorsuch’s party with clubs, corn cutters, and other crude weapons. While accounts of that day conflict, numerous individuals on both sides of the battle were injured and Gorsuch died of wounds sustained during the fight. In the immediate aftermath of the Christiana Riot, Parker and two other men, presumably fugitive slaves, escaped for Canada. U.S. officials hastily arrested anyone possibly connected with the riot, including a white miller from Christiana named Castner Hanway (1821-93). Hanway, who rode to Parker’s home on the day of the riot, was mistakenly identified as the mastermind of the riot. Along with forty-one other men, Hanway was charged with treason for “wickedly and traitorously” intending “to levy war” against the United States. Hanway’s trial began on November 24, 1851, at the old Pennsylvania State House in Philadelphia (Independence Hall) with Supreme Court Justice Robert C. Grier (1794-1870) and U.S. District Court Judge John K. Kane (1795-1858) presiding. The defense of the Christiana Riot participants became a popular cause for the abolitionist movement. Fiery abolitionist and U.S. representative for Lancaster County Thaddeus Stevens (1792-1868) led Hanway’s defense team, and abolitionist Lucretia Mott (1793-1880) sat in the courtroom on the second floor of Independence Hall throughout the trial. 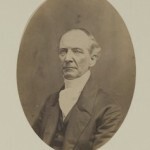 The prosecution was directed by the U.S. attorney for the Eastern District of Pennsylvania, John W. Ashmead (1806-68), and a team of lawyers from the state of Maryland. After opening arguments, Ashmead called the prosecution’s key witness, U.S. Deputy Marshal Henry Kline (1820-85), to the stand. Kline had been among Gorsuch’s party on the day of the riot and testified that Hanway was responsible for inciting Parker and the resisters. Under cross-examination, Kline admitted that he had hidden in a cornfield during the riot, so his view was obstructed. 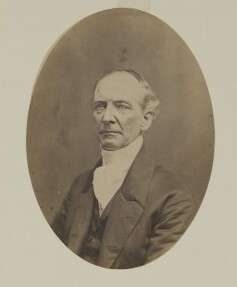 Following Kline’s testimony, the defense called twenty-nine character witnesses, including Judge William D. Kelley (1814-90), who portrayed Kline as a liar and a known kidnapper. This testimony was devastating for the prosecution. Indeed, for many Pennsylvanians—even those who were not in sympathy with the abolitionist cause—there was little interest in prosecution, because the 1850 Fugitive Slave Law seemed to represent an incursion of federal power into state sovereignty. After fifteen minutes of deliberation by the jury, Hanway was found not guilty of treason. Subsequently, federal and state officials declined to press further charges against the riot participants. The verdict served as a fuel for the abolition movement as it gained momentum in the 1850s. The events at Christiana also showed that African American men and women could organize themselves to actively resist any attempts to kidnap fugitive slaves or disturb their communities. Nevertheless, Southerners viewed the verdict as a product of Northern radicalism and a failure to equally apply the law. The sectional divisions made clear by the Christiana Riot trial deepened throughout the 1850s and ultimately led to the Civil War. James Kopaczewski is a Ph.D. student in the Department of History at Temple University. Bacon, Margaret Hope. Rebellion at Christiana. New York: Crown Publishers, 1975. Finkelman, Paul. “The Treason Trial of Castner Hanway.” In American Political Trials, edited by Michal Belknap, 77-95. Westport, Conn.: Greenwood Press, 1981. Forbes, David R. A True Story of the Christiana Riot. Quarryville, Pa.: The Sun Printing House, 1898. Giesberg, Judith. Keystone State in Crisis: The Civil War in Pennsylvania. Mansfield, Pa.: The Pennsylvania Historical Association, 2013. Harrold, Stanley. Border War: Fighting over Slavery before the Civil War. Chapel Hill: The University of North Carolina, 2010. Hensel, W.U. The Christiana Riot and the Treason Trials of 1851: An Historical Sketch. Lancaster, Pa.: The New Era Press Printing Company, 1911. Katz, Jonathan. Resistance at Christiana: The Fugitive Slave Rebellion, Christiana, Pennsylvania, September 11, 1851: A Documentary Account. New York: Crowell, 1974. Robins, James J. Report of the Trial of Castner Hanway for Treason, in the Resistance of the Execution of the Fugitive Slave Law of September 1850. Philadelphia: King & Baird, 1852. Christiana Resistance Collection, Moores Memorial Library, 326 N. Bridge Street, Christiana, Pa.
George Steinman Papers (MG-184), LancasterHistory.org Library, 230 N. President Avenue, Lancaster, Pa.
Christiana Riot Historical Marker, Lower Valley Road, Sadsbury Township, Pa.